With the advancement of electronic technology many navigational aid systems have been computerized, and hybrid and automated ships have been realized in advanced countries on shipping in the world. It is also anticipated to go forward the enlargement of size, increase of speed and also reduction of labor for ships more hereafter, and it becomes important to secure the safety of navigation of ships. As for the nautical charts, which are indispensable for the operation of ships, it becomes necessary for an electronic chart system. This kind of electronic chart display system contributes to the safety and convenience of navigation so much. For these situations the Hydrographic and Oceanographic Department,Japan Coast Guard(HOD,JCG) is making digital charts and publishing them. 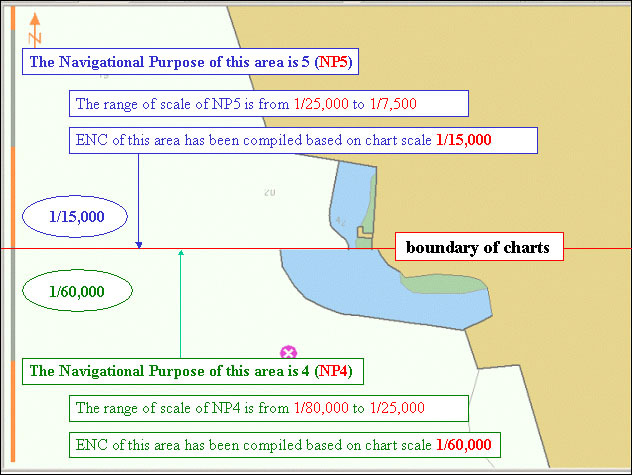 As for these digital charts are called Electronic Navigational Charts(ENC) and are based on International Hydrographic Organization(IHO) standard (S-57 Edition 3.1). And also, we are publishing the data for updating ENC. ECDIS has some functions which indicate not only chart's information but also other information and has functions that give to ship's navigator an alarm when a ship is approaching or entering into potentially dangerous areas. superimposing with Radar and other images, etc. auto loading of necessary charts, etc. storing up and re-accessing to log books, etc. ENC of Japan has been produced based on the paper charts. Therefore, accuracy of the ENC never exceeds source paper charts. A lot of information on the land is not digitized. When an ENC is displayed in larger scale than the compilation scale of the source, precision of the displayed ENC looks degraded. Particularly, the area where two different Navigational Purpose ENCs are displayed looks to have gaps. On account of above reason, you should use ENC carefully when a magnification of displaying ENC is larger than compilation scale on your system. Above case is shown as follows.